Impella RP Post-Approval Study Data Presented at ACC 2019 | ABIOMED, Inc.
NEW ORLEANS, La.--(BUSINESS WIRE)--Mar. 18, 2019-- Abiomed (NASDAQ:ABMD), a leading provider of breakthrough heart support technologies and the maker of the Impella RP heart pump, announces that survival data from the 18 month post-approval study of 42 Impella RP patients was presented at the American College of Cardiology’s (ACC) 68th Annual Scientific Session in New Orleans. The Impella RP is the only percutaneous technology with FDA PMA approval for right heart support designated safe and effective. The table below summarizes the new post-approval study data and compares it to the FDA study results submitted for Impella RP’s PMA approval. The baseline characteristics of the two populations were different with higher mortality in the salvage group. Salvage patients are some of the sickest patients in the hospital and many have suffered out-of-hospital cardiac arrest or may have been transferred to multiple hospitals before receiving Impella RP. The FDA and Abiomed believe that physicians should have the ability to attempt lifesaving recovery measures on these patients based on their best judgement. Tim Deits, a 16-year-old Impella RP patient from Huntington Beach, Calif., is an example of an extremely sick patient who experienced an unwitnessed out-of-hospital cardiac arrest event, received CPR, and survived with recovery of his native heart. 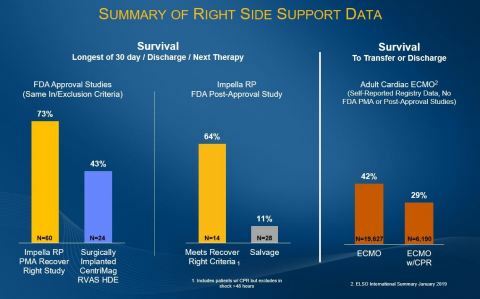 The Impella RP post-approval study data compares to a survival rate of 73% in the Impella RP PMA Study, 42% for surgically implanted CentriMag RVAS HDE study protocol, and 29% - 42% self-reported survival to transfer or discharge for adult cardiac ECMO patients1. To note, the Recover Right protocol matches the CentriMag surgical protocol defined by the FDA as right-side failure. The Impella RP is the only device submitting post-approval study data on real-world patient outcomes, including salvage utilization. This patient population will continue to be studied in the ongoing cVAD Study. Abiomed encourages clinicians to review proper inclusion and exclusion criteria for Impella RP and to follow guidelines, which recommend implantation of Impella RP within 48 hours of cardiogenic shock onset caused by right side failure. Abiomed also encourages the use of best practices such as the National Cardiogenic Shock Initiative and the Shock Care Pathway Algorithms. Abiomed is committed to improving outcomes by leading in data collection within our commercial IQ Database and cVAD post-approval studies in order to identify and validate best practices. The Impella 2.5 and Impella CP devices are FDA approved to treat certain advanced heart failure patients undergoing elective and urgent percutaneous coronary interventions (PCI) such as stenting or balloon angioplasty, to re-open blocked coronary arteries. The Impella 2.5®, Impella CP®, Impella CP® with SmartAssist, Impella 5.0® and Impella LD® are FDA approved heart pumps used to treat heart attack or cardiomyopathy patients in cardiogenic shock, and have the unique ability to enable native heart recovery, allowing patients to return home with their own heart. The Impella RP® is FDA approved to treat right heart failure or decompensation following left ventricular assist device implantation, myocardial infarction, heart transplant, or open-heart surgery. To learn more about the Impella platform of heart pumps, including their approved indications and important safety and risk information associated with the use of the devices, please visit: www.protectedpci.com. The Abiomed logo, Abiomed, Impella, Impella 2.5, Impella 5.0, Impella LD, Impella CP, Impella RP, Impella Connect, and Recovering hearts. Saving lives. are registered trademarks of Abiomed, Inc. in the United States and in certain foreign countries. Based in Danvers, Massachusetts, USA, Abiomed, Inc. is a leading provider of medical devices that provide circulatory support. Our products are designed to enable the heart to rest by improving blood flow and/or performing the pumping of the heart. For additional information, please visit: www.abiomed.com.